Orange has announced that it has exclusive dibs on the new Samsung S5600 mobile phone – a handset that's tailored for the Twitter generation. Coming complete with a 2.8-inch QVGA full touchscreen, the phone has one-click access to your favourite applications and easily customisable. So, if you don't like a particular widget, delete it and replace it with one that's on the right side of awesome. There's also an accelerometer inside, which means you can rotate the screen to your liking. There's full internet browsing on-board, so no Tweets or status updates should be missed, even if you are on the go. For those who like their mobiles to moonlight as cameras, the S5600 is equipped with 3.2MP sensor and a variety of features to make sure your picture-taking is on a par with the likes of David Bailey (on an off day). There's no need to worry about how many images you take, either, as the S5600 can store up to 8GB of media via a Micro SD. The in-built memory is a measly, however, coming in at just 80MB. Connectivity comes in the form of USB 2.0 and Bluetooth, and to top it all off the handset comes complete with an FM radio with RDS. 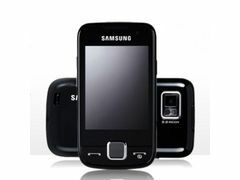 The Samsung S5600 is available now for free from Orange on a £20 per month, 24-month contact, or if you want to go down the PAYG route, you can snap it up for £159.50.